Recently renovated three bedroom, two bathroom beach house within walking distance to the township of Airlie Beach. Add the Conway National Park to your to do list! Hayman Views is a recently renovated beach house which boasts spectacular views of the Coral Sea. It is situated in Airlie Beach, the perfect base for those looking to explore the Whitsunday Islands and the Great Barrier Reef. This three bedroom, two bathroom holiday house can sleep up to eight guests at any given time. For your comfort it is fully air-conditioned and has ceiling fans throughout. It features an open plan living area where you can relax and unwind, there is even a dedicated area for the children to retreat to. You will also find a beautifully appointed kitchen complete with an oven, stovetop and dishwasher. There is a spacious deck with an outdoor pool table, BBQ and entertainment setting. This is the place to entertain family and friends. 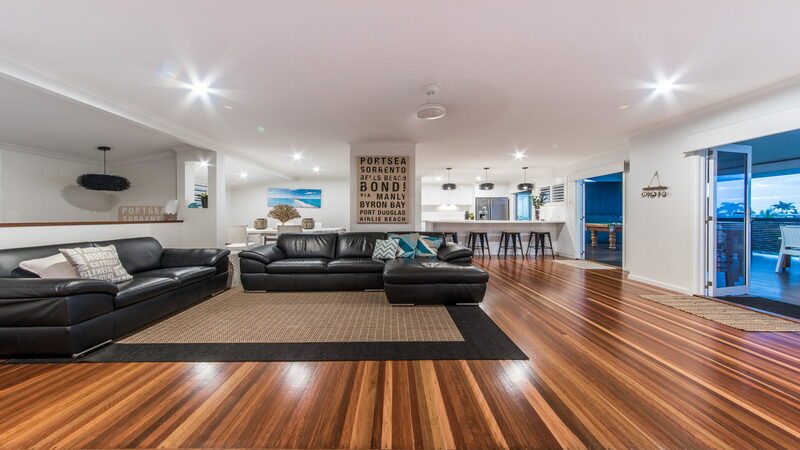 This beach house has all the creature comforts you need for an enjoyable holiday in the Whitsundays. 30 minute drive from Proserpine Airport. Four minute drive from the Port of Airlie. Three minute drive from the Airlie Beach Lagoon. This property charges a cancellation fee of 30% of the total booking value when you cancel, and the full amount if you cancel within 30 days of arrival. This beautiful 3 bedroom home is walking distance to town andhas spectacular views of the Coral Sea. Sleeping 8 guests and having 2 bathrooms- this property is perfect for the larger families, we also provide a cot and highchair. The living area is spread across two levels with a dedicated area for the children/teenagers to retreat. The bedrooms are located downstairs and the second single bedis in the secondliving area. Fully air-conditioned throughout and all the creature comforts this property ticks all the boxes.